Think about how you can help others this season — marching, canvassing, donating — and then do it. As LGBTQ Pride Month starts to rev up around the country, we know it mainly as a time for celebration, community, and visibility. Yet now, more than ever, LGBTQ Pride celebrations need to be something more. We need to be asking people to not only celebrate our community, but also educate, agitate, and advocate for us as well. When Donald Trump became president, he unleashed an aggressive agenda full of public policies that targeted women, minorities, and many marginalized communities. Many of those affected by these policies — like the Muslim travel ban, the end of DACA (Deferred Action for Childhood Arrivals), the transgender military ban, and the ramp-up of immigration raids — have felt helpless against the far-reaching consequences of Trump’s agenda. Many people, including the LGBTQ community, feel exhausted by the daily barrage of bad news and bad policy aimed at stripping away our rights. While it is easy to get disenchanted and disillusioned by the current state of our country, we have an opportunity, and a responsibility, to use our voices to resist. 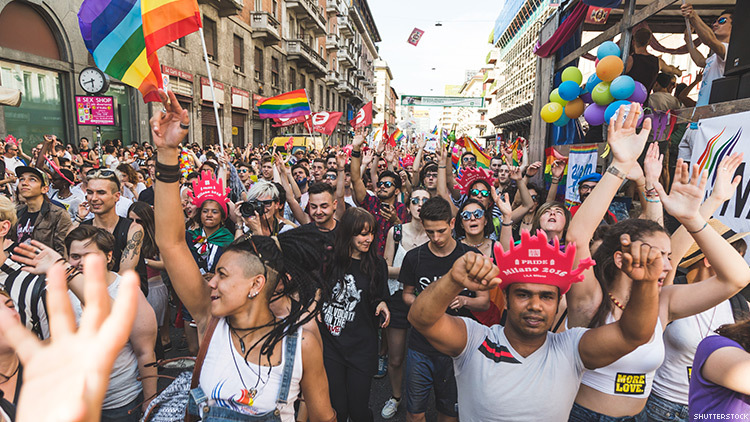 Most Pride celebrations fall in June to commemorate the 1969 Stonewall riots in New York City, a pivotal and defining moment in the modern LGBTQ rights movement. The spirit of Stonewall, when a tired and oppressed community finally had enough and took to the streets, inspired the early Pride demonstrations, which were marches about liberation and freedom. That same spirit carried us to raise our voices again in the White Night Riots after the assassination of Harvey Milk. It pushed us to not just act, but ACT UP when the world ignored the HIV/AIDS epidemic. It made us flood into the streets after Proposition 8 passed in California, and it pushed us to shout for joy as marriage equality was made the law of the land. As we again feel that same boot of oppression crushing down on us and other minority communities, it is time for us to once again use our collective might in active defense of justice and equality. As dangerous policies pass against women, minorities, and our community, we have to see that we are all connected. While we may be being targeted as individual groups, the same racism, sexism, homophobia, and transphobia drive those that seek to undermine our rights. One individual group can’t fight alone — it takes all of us coming together to support all communities under attack. And it can work. We’ve seen people stream into the streets in record numbers at the Women’s March, watched as teenage school shooting survivors led the way on sensible gun reform, and watched lawyers going to airports to help people affected by Trump’s travel ban. Our minor differences between communities meant nothing when our very liberty was under attack. This kind of resistance may seem like a daunting task, but we all have to take that small first step towards seeking justice. This doesn’t fall on one person’s shoulders; it is a movement by all of us, made up of millions of these small steps that add up to real and lasting change. All the past protests, milestones, court cases, and political battles were made up of individuals, just like you and me, who came together to be something greater than the sum of their parts. These accomplishments weren’t easy, but they were the result of people coming together as a community. Then those communities came together to form a movement to bend the arc of the moral universe a little bit more towards justice. We all have to do our part in any way we can. As one of only a handful of openly LGBTQ deans to ever lead a law school, I feel it’s my responsibility to use my platform to push for social justice. Whether it’s a DACA student whose family is facing deportation, or pushing back against Betsy DeVos’s decision to allow discrimination against transgender students, I try to take those steps of resistance whenever I can. If we all commit to taking whatever action, whatever small step that we can, we can turn those individual steps into a march together toward justice. We can use that true spirit of Pride and protests to not just defend our rights, but also push forward for greater change and equality. ANTHONY NIEDWIECKI is dean of Golden Gate University School of Law.